Peacefully at ThorntonView Long Term Care, Oshawa on Thursday, April 5th, 2018. Judy, in her 97th year. Beloved wife of Russell Smith for 71 years. Loving mother of Wendy Gregoire, Jill Drinkill and late husband David. Beloved Nan of Heather Ramsay and husband Scott; Cindi Gregoire; Brett Gregoire and wife Meghann; Kevin, Brandon and Matthew Drinkill. Great-grandmother of Kyle Ramsay (Alexandra) and Jordan Ramsay (Laura). Predeceased by brothers Bill, Morton and Victor Knox and loving sister Elsa Corbett. Relatives and friends may call at McINTOSH-ANDERSON-KELLAM FUNERAL HOME LTD., 152 King St. E., Oshawa (905-433-5558) on Friday from 2:00 to 4:00 PM and 7:00 to 9:00 PM. A memorial service will be held in the funeral home chapel on Saturday April 14th, 2018 at 2:00 PM. 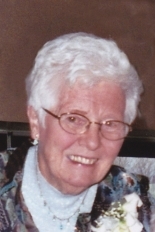 Donations in memory of Judy can be made to Alzheimer Society of Durham or ThorntonView Long Term Care (Revera Long Term Care). A very special thanks to the staff at ThorntonView for their tender and loving care. Online condolences can be share at makfuneralhome.com. And many thanks for the notification. It is with heavy hearts that we send you our love at this difficult time. It is our sincerest wish that through the grief you are all able to remember the special times spent with your wife, mother, and nan. Judy was so very special and we will forever cherish the times we were lucky enough to spend with her. The end of the road at Brady Lake will never be the same. Dear Mr. Smith, Wendy and families. My deepest condolences to all of you! May the Love you have for each other carry you through this difficult time and may the fond memories your carry in your hearts help you find Peace. My condolences go out to Russ. You had a long life together and I was so glad to have been able to know you both. I was a badminton friend. Judy was a dear, sweet woman who I was blessed to know and truly care for. To Judy’s family, I am so sorry for the loss of your Mom and Grandma. Russell, my heart hurts for you. I know how much you loved and adored your wife, she was a very blessed woman to be loved by you. You will be in my thoughts and prayers. We are sending love & hugs & prayers in the loss of dear Aunt Judy..your Wife,Mom, Grandmother , friend & more ! As you might know due to weather conditions we did not get to the service but would truly love to visit with Russell very soon. If you could get back to me with a phone number that I can reach you Wendy we will set up a date soon.